Barn Appétit: Can You Say Cruciferous? We all know the health benefits of certain vegetables. 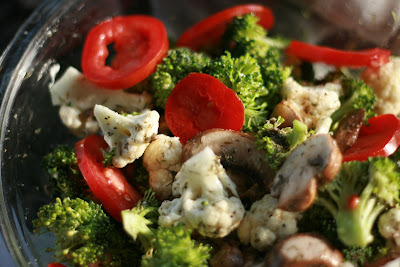 Broccoli and cauliflower are loaded with vitamins and minerals and are low in calories. Eating nature's bounty raw is a great way to obtain the vitamins and minerals that cooking diminishes. Everyone knows to eat healthy, but a lot of us don't apply our knowledge. The marinade in this recipe is popping with garlicky, dilly flavor. 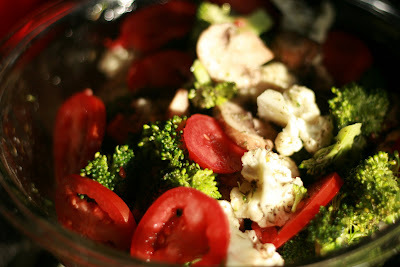 Tomatoes and mushrooms pretty it up and offer their health benefits as well. Leftovers are equally delicious to snack on. To Your Health: Marinated Veggies. Check out the other great ideas for speedy, healthy meals over here at Gelskitchen No Time To Cook. Wash and prepare the veggies. Place in a large bowl. Mix the marinade ingredients together and pour over the veggies. Mix until the veggies are coated with the marinade. You may serve immediately, but flavors actually improve the next day.